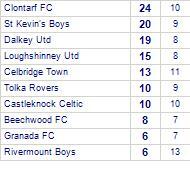 Tolka Rovers despatch Castleknock Celtic. 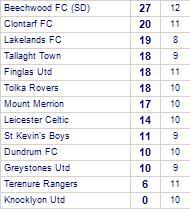 Castleknock Celtic has yet to win in this competition. 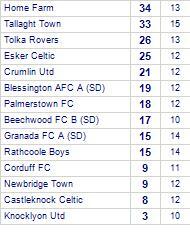 Tolka Rovers beat Greystones Utd. Youths Sun 5 North (KO 11am unless stated). Granada FC take spoils against Tolka Rovers. Tolka Rovers beaten by Crumlin Utd. 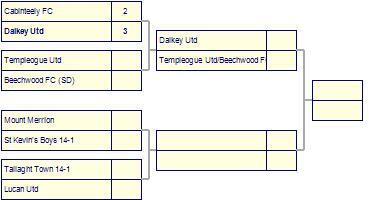 Tolka Rovers has yet to win in this competition. 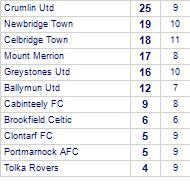 Crumlin Utd has yet to be beaten in this competition, having won 4 out of its last 5 games. Tallaght Town take all points from Tolka Rovers. Tallaght Town has yet to be beaten in this competition, having won 6 out of its last 8 games. Tolka Rovers take spoils against Rivermount Boys. Rivermount Boys have yet to win away from home. 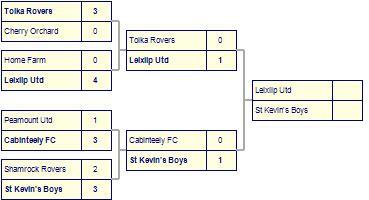 Knocklyon Utd 14-1 are defeated by Tolka Rovers.